I have to say that this is a bold book for both the author and the publisher. Most of the substances covered are things that have never and would never enter my body, but I found it interesting to read about them in such a straightforward way. It's divided into four sections. Classical Psychedelics has things like Peyote, DMT, LSD and a few less familiar substances. Empathogenics covers MDA and MDNA (Ecstasy). Dissociative Psychedelics includes Ketamine, Salvia and Nitrous Oxide as well as one I never heard of called DMX. Unique Psychedelics covers Cannabis, which I wouldn't class as a psychedelic at all, and a few weird things like fish and sea sponges and mad honey. It appears to be the miscellaneous chapter. 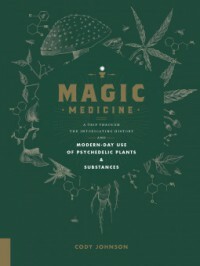 The Introduction on the future of psychedelic medicine points out that many of these substances were invented for medicinal use, or in the case of natural substances like Cannabis and Peyote, used historically by Shamen. I hadn't known there was actually an organization called MAPS, the Multidisciplinary Association for Psychedelic Studies, that advocates proper research on psychedelics and is pushing to have them accepted into mainstream medicine. The author is undeniably pro-psychedelics and I think even glosses over some of the down sides, but he cites research I've read about elsewhere of substances like MDMA being used successfully to treat PTSD and some forms of depression. The overall tone of the book is mostly scientific. The history of where each substance came from and chemical compound information is covered, followed by a relation of what the experience is like, keeping in mind that such experiences are subjective. Famous names like Timothy Leary crop up in appropriate places as well as some lesser known names of researchers like Sasha Shulgin, who may be well known among those who study this subject but new to people like myself. Therapeutic use of some substances is also explained as well as follow-on recreational use. The refreshing, no holds barred approach allows complete information regardless of legal status or morality police opinion. Extensive references and index are included. The book would be appropriate to a medical library, though I found it very interesting for personal reading.